Believe it or not, indoor air is actually known to contain many more contaminants than outdoor air. To remove these harmful particles and pollutants, getting an air purifier is a big help. You can find such quality and efficient machines that fit your lifestyle and needs at an affordable budget. The GermGuardian AC4900CA is a lightweight small appliance perfectly suitable for small and medium-sized rooms and it is easy on the pocketbook as well. It features a simple design that complements the look of your home. Aside from its portable design, this unit has plenty of features to offer. Let’s take a look at a few of them. 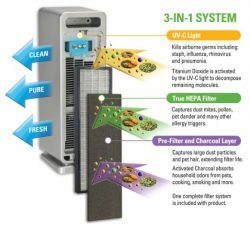 The GermGuardian AC4900CA is a 3-in-1 air purifier that uses a true HEPA filter which effectively traps 99.97% of particles down to .3 microns. This device fits perfectly in smaller to medium sized rooms with its slim tower design. Its advanced filtration system makes it suitable for those who are suffering from allergies. According to the doctors of the American Academy of Pediatric Allergy and Immunology, HEPA filters reduce indoor pollutants that can trigger asthma. What makes this air cleaner a good choice? Even at its affordable price, it has a 3 stage filtration system which is proven effective in eliminating contaminants and other pollutants. The air passes through the charcoal pre-filter in the first state of the filtration process which traps huge contaminants like dander, lint, and dust and also begins to remove odors. In the second stage of the process, the air passes through the HEPA filter which captures even the most minute particles. For the last filtration process, there is the UV-C light to remove foul odor and airborne germs. For its price, the GermGuardian AC4900CA uses innovative features like the UV-C light technology which removes germs, bacteria and virus on any surface which are the leading causes of various diseases like tuberculosis, pneumonia, bronchitis, etc. The UV light activates the TiO2 or the Titanium Dioxide in the filter to remove the germs, bacteria and viruses. 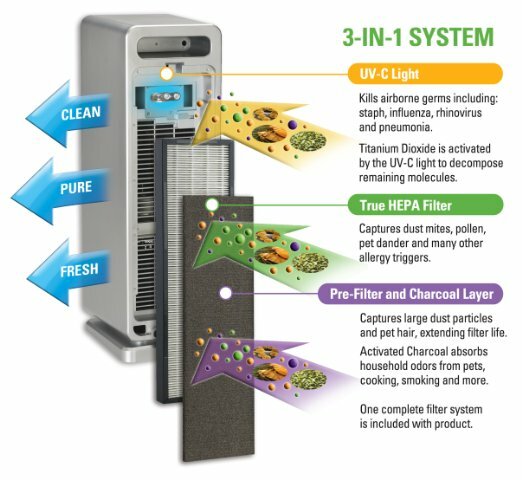 It also uses this technology to get rid of airborne bacteria and molds while the charcoal filters work to reduce odor. Using the appliance is a breeze. Simply adjust the UV-C and the 3-speed controls. With its filter replacement indicator, you know if it is time to change the filter. Regarding maintenance, you will need to replace filters every 6 to 8 months which is typical since most purifiers require filter replacements. However, in many cases, the filter life can be extended to 9+ months if dusting and vacuuming are done regularly in the space where the unit is working. What you will like about this appliance is that it is not only a very efficient device, it also operates quietly so it can be used anytime and anywhere. You can use the device all throughout the night without it causing any disturbance or interruption. These two models significantly vary concerning the price, features, and specs. The GermGuardian AC9200WCA is a bit more expensive as it is more of a premium air purifier packed with great features and specifications. 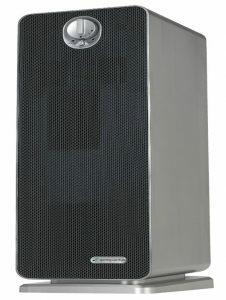 This model also uses UV-C light technology and HEPA filters the same with GermGuardian AC4900CA. What is nice with GermGuardian AC9200WCA is that it has other features like the ionizer option for better allergen control and it has higher CADR rating which makes it a high powered air cleaning unit. However, the AC4900CA is an excellent economical choice for most mid-sized spaces. Should You Buy the GermGuardian AC4900CA? The GermGuardian AC4900CA is a small-sized and affordable air cleaner full of innovative features. If you are searching for a device that can give you efficient air cleaning power at a decent price point, this unit is an excellent choice. It is lightweight which makes it easier to move around the house or even to and from the office. Using and cleaning the air purifier is straightforward and easy. This unit is an ideal choice for those who have allergies and pets at home.